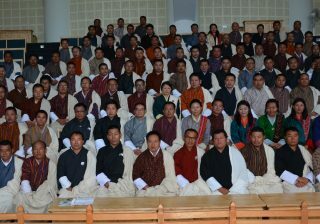 The Election Commission of Bhutan is pleased to inform the general public that a total of twenty two cases, as of 3rd of July 2013, have been registered with the Election Dispute Settlement System which comprises the Dzongkhag Election Dispute Settlement Body (DEDSB) in the 20 Dzongkhags, the Central Election Dispute Settlement Body (CEDSB) in ECB Head Office and the full Election Commission itself. Case # 1. Ten Dorji, PDP Coordinator in Samdrup Jongkhar Dzongkhag complained that he was dissatisfied with the decision and action taken by ECB in the case against DPT’s Candidate, Norbu Wangzom during the Primary Round. The case was dismissed as the case pertained to the Primary Round and the decision was taken by the ECB and appeal has to be in an Election Petition. Case # 2. In the case filed on 8/6/2013 by Chorten Tshering, DPT Dzongkhag Coordinator of Trashi Yangtse Dzongkhag against the PDP Dzongkhag Coordinator Langa Tshering and Thukten for conducting meeting without prior permission, the Trashi Yangtse DEDSB investigated and conducted a hearing on 17th of June 2013 and issued warning to both Langa Tshering and Thukten. Case # 3. Dorji Leki, DPT Dzongkhag Coordinator of Monggar filed, on 11/6/2013, a case against Namgay Dorji, PDP Dzongkhag Coordinator for conducting meeting without prior permission of the Returning Officer. The DEDSB investigated the case and issued a warning to the PDP Dzongkhag Coordinator. Case # 4. The PDP filed a cautionary note on 12/6/2013 that the DPT was organizing meeting with Taxi Drivers at Mystic Taste Restaurant. 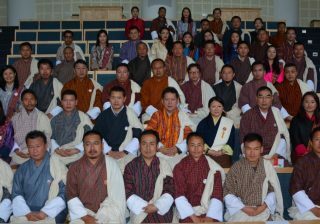 The Thimphu DEDSB dismissed the case on 27/06/2013. Case # 5. Sonam Dorji, PDP’s Trashigang Dzongkhag Coordinator, on 12/6/2013 alleged that the Mangmi and Tshogpa of Udzorong Gewog set up the DPT office at the Mangmi’s house. DEDSB asked the complainant to resubmit the complaint with the necessary details. At the same time an investigation was also carried out following which the Trashigang DEDSB dismissed the case. Case # 6. Tashi Thinley, DPT Dzongkhag Coordinator of Wangdue Phodrang Dzongkhag alleged on 13/6/2013 that Kinley Tenzin, PDP Dzongkhag Coordinator and Dorji from Rubesa Gewog held meeting without prior approval on 11th of June 2013. A hearing was conducted on 19/6/2013 and the DEDSB dismissed the case due to lack of evidence. Case # 7. Nima Drukpa filed a case in Samtse on 13/6/2013 against Durga Prasad Chhetri, DPT Candidate, Tashichhoeling for the serving meals and drinks at a coordination meeting involving around 50 people by the DPT Chiwog Coordinator. An investigation was carried out following which the Samtse DEDSB, on 17th June 2013, issued warning to Durga Prasad Chhetri, DPT Candidate and the DPT Chiwog Coordinator of Kuchinthang. Case # 8. Yogesh Tamang, PDP Candidate, on 13/6/2013, lodged a case against Passang Thing Tamang for slander through phone. However, the case was withdrawn by the complainant on 17/6/2013 and the case stands dismissed. Case # 9. On 13/6/2013, Rinchen Draba, PDP Dzongkhag Coordinator, filed a complaint that Namgay Lhamo, wife of Namgay Penjor, DPT Candidate was campaigning on behalf of Namgay Penjor. After investigation and hearing from the witnesses, the case was dismissed due to insufficient evidence. Case # 10. Sonam Dorji, PDP Dzongkhag Coordinator of Trashigang filed a case against Duptho, Party Worker, Sonam Dukpa, Business-man, Minjur Dorji former Home Minister and Thinley Palden Dorji, Candidate on allegations of bribery and objectionable influence. The DEDSB dismissed the case as it related to the Primary Round and also the complainant did not submit the material facts and details as required by the DEDSB. The ECB, however, reminded Sonam Dukpa to avoid any such situation or support. Case # 11. This case is an appeal against the decision of the Trashigang DEDSB and is currently being looked into by the CEDSB. Case # 12. Tandin Wangchuk, PDP Athang_Thedtsho Candidate filed a case with the Wangdue Phodrang DEDSB on 16/6/2013 that Leki Tshering, Sr. ADM Officer, PHPA II (a civil servant) accompanied Passang Thrinlee, DPT Athang_Thedtsho Candidate on his campaign in Rinchengang. The case was dismissed due to lack of evidence by the DEDSB on 25/6/2013. It was appealed by Leki Tshering on 30/06/2013. The CEDSB, after reviewing the case, upheld the DEDSB’s decision. Case # 13. Mingbo Drukpa, PDP candidate filed an allegation on 16/6/2013, objecting to the statements made during the official tour undertaken by the Dzongdag of Samdrup Jongkhar to the Gewogs of the Dewathang_Gomdar Demkhong. The CEDSB, after reviewing the explanation provided by the Dzongdag and giving opportunity for further submission by Complainant, dismissed the case on 26th of June 2013. Case # 14. This case is an appeal against the decision of the Haa DEDSB and is currently being looked into by the CEDSB. Case # 15. Lhundup Dorji, DPT Gewog Coordinator in Trashigang, on 17/6/2013, filed a complaint against Karma, Druk Nyamrup Tshogpa Supporter of supporting the PDP. As the complainant did not re-submit the complaint with the pertinent details, as was asked to do so, the Trashigang DEDSB dismissed the case. Case # 16. Lhundup Dorji, DPT Gewog Coordinator in Trashigang, on 17/6/2013, filed a complaint against Tenzin Wangda and Yeshey Tshewang, DNT Gewog Coordinator and Supporter and Phuntsho Norbu, DCT Coordinator for supporting the PDP. As the complainant did not re-submit the complaint with pertinent details, as was asked to do so, the Trashigang DEDSB dismissed the case. Case # 17. Sangay Norbu DPT Coordinator for Yurung Chiwog, on 20/06/2013, filed a case against Tendrel Gyeltshen and Pema Tshewang, PDP Supporters, for organizing meeting by unauthorized party workers in contravention of Electoral Laws of Kingdom of Bhutan. The Pema Gatshel DEDSB, on 27/06/ 2013, imposed a fine of Nu. 3,000/- each on Tendrel Gyeltshen, Pema Tshewang, Pema Zangmo and Dorji Wangchuk. Case # 18. Kinley Dorji, Representative of the PDP’s Athang_Thedtsho Candidate on 21/6/2013 lodged a complaint with the Wangdue Phodrang DEDSB against DPT SUPPORTERS for transportation of people during the DPT Presidential meeting from Bjednag, Nahi and Kamichu to Gangteythangkha and registration of new members. The Wangdue DEDSB on 21/6/2013 dismissed the case as per the letter No. ECB/CEC_01/2013/4261 dated 21/6/2013 addressed to the two Presidents that a complaint lodged on behalf of a Party or a Candidate shall be accepted only if endorsed by the concerned Candidate, Party President or President’s representative. Case # 19. Wangdi Gyeltshen, Naja Gewog Tshogde Tshogpa filed a complaint on 24/6/2013 alleging that Chencho Dorji, DPT Candidate had misused Gewog funds. The case was dismissed by the DEDSB for lack of evidence on 24/6/2013. Case # 20. This case was referred by the Media Arbitrator and is currently being looked into by the CEDSB. Case # 21. Upon some ECB Officials receiving campaign SMS from some of the PDP Candidates, the PDP was required to explain the sending of mass SMS on 24/6/2013 without prior approval of the ECB. The CEDSB decided on 1/7/2013 to reprimand the PDP. Case # 22. Dorji Leki, DPT’s Monggar Dzongkhag Coordinator filed a case on 1st of July 2013 alleging that Sonam Dorji of Tagchhu Village residing in Thimphu bribed three voters of Tsakaling Gewog with Nu. 500, Nu 600 and Nu. 700 and a Gho each. The Monggar DEDSB, based on the investigation report and hearing conducted on 2/7/13 found that Sonam Dorji tried to influence one of the voters. Its decision issued on 3/7/13 was to impose on Sonam Dorji a fine of the daily minimum wage rate for thirty days and the gift and cash to be forfeited. Case # 23. This case was received on the last day of decision by the DEDSB and is currently being looked into by the CEDSB. Additionally, the Media Arbitrator has, in the case filed by The Bhutanese against Kesang Wangdi, DPT’s Khamdang_Ramjar Candidate, warned Kesang Wangdi on 26th of June 2013 for his wrong comment that “The Bhutanese paper was banned by the government for breaking the laws” during the Public Debate on 23rd June 2013. The Media Arbitrator is also currently looking into a complaint related to media and advertisement. An update on the cases currently under review will be informed to the general public once the process is completed and decisions taken thereof. The general public and all stakeholders are also reminded that an appeal against the decision of a DEDSB has to be filed within five days of the decision and within two days of the CEDSB’s decision. As provided, the twenty DEDSBs dissolve automatically on 4th of July 2013 (nine days before Poll Day) and the CEDSB dissolves automatically on 7th of July 2013 (six days before Poll Day). Thereafter, all election-related cases shall be decided directly by the Election Commission and any decision of the Commission may be appealed through an Election Petition. Index Number and Room Allocation for Written Examination.